Children are some of the most vulnerable members of society, and are routinely submitted to the worst forms of violence. The South African legal justice system was designed to be the final protectors of societies and individuals, yet it is not uncommon for those in power to violate the rights of the country’s own citizens. OL Seleke and Ezekiel Dikio addressed this contentious issue during the ninth Child Moot Court competition. These two third-year LLB students represented the North-West University (NWU) at this annual competition hosted by the University of Pretoria’s Centre for Child Law. Participants from nine universities had to argue a set of hypothetical facts, considering whether children can successfully rely on their constitutional right to assemble without incurring criminal liability from the Regulation of Gatherings Act. A number of academics, practising attorneys and advocates judged the preliminary and semi-final rounds. The duo from the NWU team did an excellent job, only losing out in the last round robin part of the competition. The University of Cape Town and the University of the Witwatersrand (Wits) advanced to the final round, with Wits emerging victorious. “Very few methods are available to South African children to self-advocate when their rights are being infringed. We have to ensure that they have the necessary platforms to voice their concerns without being in conflict with the law,” he concluded. 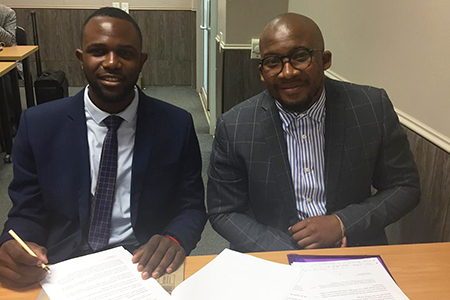 OL Seleke and Ezekiel Dikio represented the NWU at the ninth annual Child Moot Court competition.